Triage is the assessment of a security event to determine if there is a security incident, its priority, and the need for escalation. As it relates to potential malware incidents the purpose of triaging may vary. A few potential questions triaging may address are: is malware present on the system, how did it get there, and what was it trying to accomplish. To answer these questions should not require a deep dive investigation tying up resources and systems. Remember, someone needs to use the system in question to conduct business and telling them to take a 2 to 4 hour break unnecessarily will not go over well. Plus, taking too much time to triage may result in the business side not being happy (especially if it occurs often), the IT department wanting to just re-image the system and move on, and you limit your ability to look in to other security events and issues. In this post I'm demonstrating one method to triage a system for a potential malware incident in less than 30 minutes. The triage technique and the tools to use is something I've discussed before. I laid out the technique in my presentation slides Finding Malware Like Iron Man. The presentation also covered the tools but so has my blog. The Unleashing auto_rip post explains the RegRipper auto_rip script and the Tr3Secure Data Collection Script Reloaded outlines a script to collect data thus avoiding the need for the entire hard drive. The information may not be new (except for one new artifact) but I wanted to demonstrate how one can leverage the technique and tools I discussed to quickly triage a system suspected of being infected. 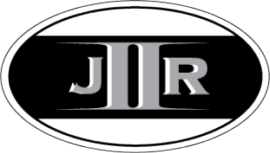 As jIIr is my personal blog, I'm unwilling to share any casework related to my employer. However, this type of sharing isn't even needed since the demonstration can be conducted on any infected system. In this instance I purposely infected a system using an active link I found on URLQuery. Infecting the system in this manner is a common way systems are infected everyday which makes this simulation worthwhile for demonstration purposes. There are numerous ways for a potential malware incident to be detected. A few include IDS alerts, antivirus detections, employees reporting suspicious activity, or IT discovering the incident while trying to resolve a technical issue. Regardless of the detection mechanism, one of the first things that have to be done is to collect data for it to be analyzed. The data is not only limited to what is on the system since network logs can provide a wealth of information as well. My post’s focus is on the system's data since I find it to be the most valuable for triaging malware incidents. Leverage the Tr3Secure Data Collection Script to collect the data of interest from the system. The command below assigns a case number of 9-20, collects both volatile and non-volatile data (default option), and stores the collected data to the drive letter F (this can be a removable drive or a mapped drive). The second script to leverage is the TR3Secure Data Collection Script for a User Account to collect data from the user profile of interest. Most of the time it's fairly easy to identify the user profile of interest. The detection mechanism may indicate a user (i.e. antivirus logs), the person who uses the system may have reported the issue, the IT folks may know, and lastly whoever is assigned the computer probably contributed to the malware infection. The command below collects the data from the administrator and stores it in the folder with the other collected data. The benefit to running the above collection scripts over taking the entire hard drive is twofold. First, collection scripts are faster than removing the hard drive and possibly imaging it. Second, it limits the impact on the person who uses the system in question until there is a confirmation about the malware incident. When completing those steps there are a few things to look for to identify artifacts associated with a malware infection. These aren't IOCs but artifacts that occur due to either the malware characteristics or malware running in the Windows environment. Below are the malware indicators to look for as the analysis steps are performed against the data collected from the system. Reviewing the parsed prefetch files revealed a few interesting items. As shown below there was one executable named 5UAW.EXE executing from the temporary Internet files folder and another executable named E42MZ.EXE executing from the temp folder. Looking at the loaded modules for 5UAW.EXE prefetch file showed a reference to the E42MZ.EXE executable; thus tying these two programs together. Looking at the loaded modules for the E42MZ.EXE prefetch file showed references to other files including ones named _DRA.DLL, _DRA.TLB, and E42MZ.DAT. These identified items in the prefetch files are highly suspicious as being malware. Before moving on to other program execution artifacts the prefetch files were sorted by the last modified time in order to show the system activity around the time 09/20/2013 15:34:46. As shown below nothing else of interest turned up. The parsed program execution artifacts from the registry are stored in the 06_program_execution_information.txt report produced by auto_rip. Reviewing the report identified the same programs (E42MZ.EXE and 5UAW.EXE) in the Shim Cache as shown below. So far the program execution artifacts revealed a great deal of information about the possible malware infection. However, there are still more program execution artifacts on a Windows system that are rarely discussed publicly. One of these artifacts I have been using for some time and there is nothing about this file on the Internet (not counting the few people who mention it related to malware infections). The artifact I'm talking about is the C:\Windows\AppCompat\Programs\RecentFileCache.bcf file on Windows 7 systems. I'm still working on trying to better understand what this file does, how it gets populated, and the data it stores. However, the file path indicates it's for the Windows application compatibility feature and its contents reflect executables that were on the system. The majority of the time the executables I find in this artifact were ones that executed on the system. The Tr3Secure Data Collection Script preserves this file and viewing the file with a hex editor shows a reference to the 5uAw.exe file. This item stood out for two reasons. First, the key's last write time is around the same time when the programs of interest (E42MZ.EXE and 5UAW.EXE) executed on the system. The second reason was because the file name_dRA.dll was the exact same as the DLL referenced in the E42MZ.EXE's prefetch file (C: \USERS\LAB\APPDATA\LOCAL\TEMP\7ZS1422.TMP\_DRA.DLL). The previous analysis steps revealed a lot of information about the potential malware infection. It flagged executables in the temp folders, a DLL in the ProgramData folder, and identified a potential persistence mechanism (browser helper object). The last analysis step in the triage process uses the found leads to identify any remaining malware or files associated with malware on the system. This step is performed by analyzing the file system artifacts; specifically the master file table ($MFT). To parse the $MFT there are a range of programs but for this post I'm using TZworks NTFSWalk. Below is the command for NTFSWalk. Note: the -csvl2t switch makes the output into a timeline. Reviewing the $MFT timeline provides a more accurate picture about the malware infection. After importing the csv file into Excel and searching on the keyword 5UAW.EXE brought me to the following portion of the timeline. The cool thing about the above entry is that the 5UAW.EXE file is still present on the system and it was the initial malware dropped onto the system. Working my way through the timeline to see what occurred after the 5UAW.EXE file was dropped onto the system showed what was next. Numerous files were created in the C:\ProgramData\savEnshare folder. The file names are the exact same that were referenced in the E42MZ.EXE's prefetch file. The last entries in the timeline that were interesting are below. These entries show the program execution artifacts already identified. The triage technique confirmed the system in question does appear to be infected. However, the last remaining task that had to be done was to confirm if any of the identified items were in malicious. The TR3Secure Data Collection Script for a User Account collected a ton of data from the system in question. This data can be searched to determine if any of the identified items are present. In this instance, the ProgramData folder was not collected and the temp folder didn't contain the E42MZ.EXE file. However, the collected the Temporary Internet Files folder contained the 5UAW.EXE file. The VirusTotal scan against the file confirmed it was malicious with a 16 out of 46 antivirus scanner detection rate. 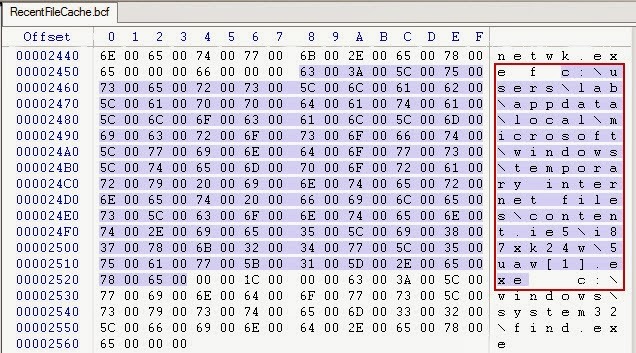 The quick behavior analysis on the file using Malwr not only shows the same activity found on the system (keep in mind Malwr run the executable on XP while the system in question was Windows 7) but it provided information - including hashes - about the files dropped into the ProgramData folder. In this post I demonstrated one method to triage a system for a potential malware incident. The entire triage process takes less than 30 minutes to complete (keep in mind the user profile collection time is dependent on how much data is present). This is even faster than a common technique people use to find malware (conducting antivirus scans) as I illustrated in my post Man Versus Antivirus Scanner. The demonstration may have used a test system but the process, techniques, tools, and my scripts are the exact same I've used numerous times. Each time the end result is very similar to what I demonstrated. I'm able to answer the triage questions: is malware present on the system, how did it get there, what's the potential risk to the organization, and what are the next steps in the response. Great stuff, Corey...thanks for posting it. Re: RecentFileCache.bcf - I hope the parser for this that I sent was helpful. Looking at the file, beyond the header, the contents of this file are just a series of DWORD size values, followed by the Unicode string for the executable path. Re: Tr3Secure scripts...I've looked at them...great job! I like how you've commented things in the batch files; I'll admit that I commented stuff out because I didn't want to get the tool, or I wanted to avoid duplication. I think it's very useful for data collection...adding a bit of automated processing around the collected data might also be very useful. Excellent post Corey. Thank you. I'm learning a lot from these posts. Thanks for posting. I'll contact you offline about the RecentFileCache.bcf file. I guess we think alike on some things. One of the next programs/scripts I was going to work on was to automate the processing of the collected data. I'm still thinking about how to implement this but I agree it would be useful to be able to collect the data and parse it within minutes. I can see that a good deal of work is still needed to understand (and subsequently explain) the contents of the RecentFileCache.bcf file. As of now, there really isn't much context to the file, as there doesn't seem to be a great deal of metadata. So, maybe about all we can do is add some checks to the contents, sort of like we did with the Prefetch file and AppCompatCache data parsers, looking for things that might be deemed "bad"; files running from paths that include "Temp" or "AppData", etc. Kudos. I still owe you research . . . I can confirm that the scripts will run remotely, and, even better, against batches of systems. That's awesome about batches of systems. You can use ntfscopy developed by tzworks if you want to retrieve the usnjrnl artefact. I tried to use public version of ntfscopy in a script but I couldn't get it to work. I received a message about a license but ntfscopy worked fine from the command line. I may revisit this.